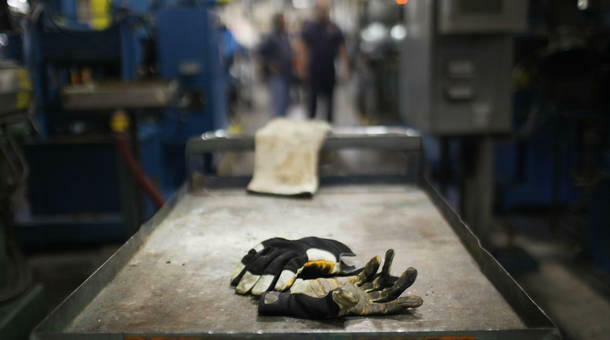 Some employers say there are labor shortages in skilled manufacturing. The U.S. unemployment rate is at 5.0 percent, job openings are abundant, and employers say labor shortages are starting to develop in some fields, especially skilled manufacturing. At Benchmade Knife Company in Oregon City, Ore., the company’s high-end hunting and utility knives are precisely tooled by skilled machinists. “We constantly have manufacturing positions, machine operators, finishers, assemblers,” said Benchmade CEO Les de Asis. The company has been growing steadily for years and now employs 260, with 25 additional positions currently open. The Manufacturing Institute, a trade group supporting employers, has reported that 2 million production jobs will go unfilled in the next decade, because workers lack the right skills. According to the trade group’s 2015 report, “Skills Gap in U.S. Manufacturing” (a collaboration with Deloitte and Touche), three out of four executives say the skills gap is now hampering growth and adoption of new technology to improve productivity. Bayard Winthrop, CEO of apparel company American Giant, said his company is also struggling to fully staff operations and keep up with customer demand. “We’re trying to hire as fast as we can, though that has not been the easiest thing for us,” Winthrop said. American Giant operates factories in the textile heartland of North and South Carolina, and has adopted a “team-manufacturing” production process in which workers have to do a wide range of tasks, rather than just a few that they repeat over and over again. Other executives have complained that new high-school and community-college graduates don’t have sufficient math proficiency and machine skills to operate new equipment. But UC Berkeley economist Jesse Rothstein is skeptical of employers' complaints about a widespread and growing skills gap in the U.S. economy. He said companies have ways to address the labor problems they face and find the workers they need. Rothstein said neither development is evident in the economy right now.